The Battle of Poitiers occurred during the Hundred Years' War (1137-1453). The Black Prince's victory took place on September 19, 1356. In August 1356, Edward, Prince of Wales, better known as the Black Prince, began a large scale raid into France from his base in Aquitaine. Moving north, he conducted a scorched earth campaign as he sought to ease pressure on English garrisons in northern and central France. Advancing to the Loire River at Tours, his raid was stopped by an inability to take to the city and its castle. Delaying, Edward soon had word that the French king, John II, had disengaged from operations against the Duke of Lancaster in Normandy and was marching south to destroy the English forces around Tours. Outnumbered, Edward began retreating back towards his base at Bordeaux. Marching hard, King John II's forces were able to overtake Edward on September 18 near Poitiers. Turning, Edward formed his army into three divisions, led by the Earl of Warwick, the Earl of Salisbury, and himself. Pushing Warwick and Salisbury forward, Edward placed his archers on the flanks and retained his division and an elite cavalry unit, under Jean de Grailly, as the reserve. To protect his position, Edward arrayed his men behind a low hedge, with marsh to left and his wagons (formed as a barricade) to the right. On September 19, King John II moved to attack Edward's forces. Forming his men into four "battles," led by Baron Clermont, Dauphin Charles, the Duke of Orleans, and himself, John ordered an advance. The first to move forward was Clermont's force of elite knights and mercenaries. 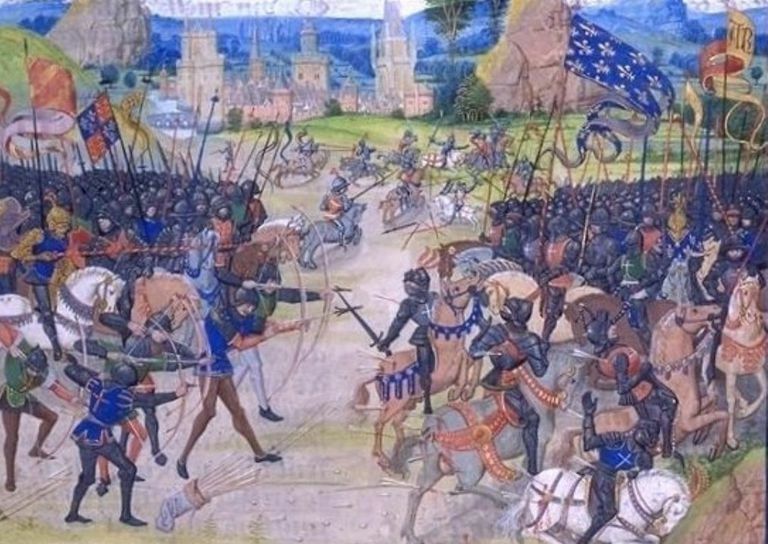 Charging toward Edward's lines, Clermont's knights were cut down by a shower of English arrows. The next to attack were the Dauphin's men. Advancing forward, they were constantly harried by Edward's archers. As they neared, the English men-at-arms attacked, nearly encircling the French and forcing them to retreat. As the Dauphin's broken forces retreated they collided with the Duke of Orleans' battle. In the resulting chaos, both divisions fell back on the king. Believing the fight to be over, Edward ordered his knights to mount to pursue the French and dispatched Jean de Grailly's force to attack the French right flank. As Edward's preparations were nearing completion, King John approached the English position with his battle. Moving out from behind the hedge, Edward attacked John's men. Firing into the French ranks, the archers expended their arrows and then picked up weapons to join the fight. Edward's assault was soon supported by de Grailly's force riding in from the right. This attack broke the French ranks, causing them to flee. As the French fell back, King John II was captured by English troops and turned over to Edward. With the battle won, Edward's men began tending to the wounded and pillaging the French camps. In his report to his father, King Edward III, Edward stated that his casualties were only 40 killed. While this number was probably higher, English casualties in the fighting were minimal. On the French side, King John II and his son Philip were captured as were 17 lords, 13 counts, and five viscounts. In addition, the French suffered approximately 2,500 dead and wounded, as well as 2,000 captured. As a result of the battle, England demanded an exorbitant ransom for the king, which France refused to pay. The battle also showed that superior English tactics could overcome greater French numbers.